The physical journey has been a real adventure. The slow progress in kilometres per day has meant the many stops have brought me to places I could not have planned to go to if I had used guidebooks to go on a holiday. From arriving in Serbia with its crazy paperwork, lovely people and distinct culture the voyage continued on along the Serbian side of the river. The Croatians don’t bother much with controlling the river, but the Serbians take it all very seriously, and they take serious money too. Serbia also caused many communication problems because their telephone system is basically organised crime, authorised by the state and operated by their telecom racket. All credits vanish and payments last seconds, they raid peoples bank accounts through their phone bills and officially charge four pounds a minute (about six euros) and one pound a text, which often has to be sent twice. No matter how much I put on my phone the credit was gone in minutes. To contact and organise the backup motorhome became a nightmare, and I had to arrange destinations before setting off with the Banana. This is more difficult than it sounds. I would estimate how far I could go in a day, chose a town nearby and arranged to be there later. Using the GPS had its limitations as it does not show the tiny mud tracks the lead to the river and the outline of the river itself is just that. I met up with two Dutch couples who had similar GB cabin cruisers. After doing the paper work together and joining them for evening meal, singing and playing guitar they agreed to take me with them for one day. I left them in a marina to find moorings and patrolled the huge marina at Novi Sad; the motorhome was nowhere to be seen, and the marina wanted 100euros per boat for the night. I went to a beach and before I got off the Banana I was faced with two men, who told me to clear off as it was a private beach; I moved to the next building down river which had two rowing clubs and a slip way. A young man approached and asked me what I needed, offered a shower or a drink. I spent two days with him, staying in the motorhome and visiting the town which had a big music festival being prepared called EXIT, which I thought appropriate with the Brexit vote. I chose my next destination beyond Belgrade; Pancevo, which had a marina and road access. Unfortunately, it was further away than I thought or the river flowed slowly on this part. I found I was watching ahead for signs of a town, and looking sideways as the sun started to set. When the sun was touching the tops of the trees I started to look along the river bank for a refuge. This came in the form of a family sitting in their covered balcony over their riverside jetty. I arrived at their jetty to ask where and how far the nearest town was; they could not understand me but gestured for me to come up and talk to them. I ended up staying the night, had fabulous hospitality and was helped in every way possible. I did not meet up with motorhome as the arrangements failed and they helped me find it the next day. Serbia had a mix of overzealous, greedy, money grabbing official bureaucracy and generous helpful and very hospitable people. I After Novi Sad, I continued the voyage alone, using the outboard and sailing slowly but steadily from town to town. Long, hot, humid, uncomfortable days in the sun, sweat soaked Tshirt under the life jacket and attacks from the biggest horse flies I have ever seen made an interesting contrast to the hypnotic engine noise and enchanting, barely unbroken tree lined river banks and olive green waters of the Danube. 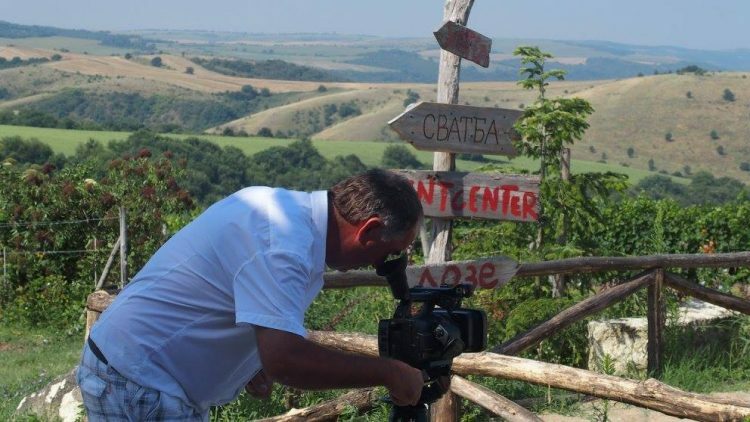 I travelled through storms, wind and hot sun, eventually coming to the boarder of Serbia, on both sides of the river to Romania with Serbia on the other bank. With border police patrol boats and Serbia still trying to steal any credits on the phone arrangements for meeting up with the motorhome became a practiced ritual. I had stopped at the Serbian port of *********** with its medieval fortress and café shape like a French Gendarmes hat, to do the paperwork to leave Serbia. I met up with a man I had uncounted whilst entering Serbia, and, got a lift from a Romanian ship which took me through the first Iron gates lock system and the most beautiful river valley on the Danube which I filmed from the deck of the ship in high winds. The Romanian customs town of ***** provided an interesting stay. The ship’s captain radioed ahead to find out what the paper work position was when arriving officially in Romania. Colour drained from his face when he heard that he would have to do all his Serbian paperwork again because he had taken a passenger and also changed his cargo to include the transport of inflatable fruit. His solution was to ditch me mid river and get as far away from me as possible. All the authorities could do when I landed was to ask for my passport and ask the question. ‘What is your final destination? ‘ ‘The same as yours’ I replied, ‘the grave’. It was clear that I had just left behind the last ship to give me a lift; although, being the unreasonable optimist, I would ask many other ship for a tow. I arrived at Cetate, Romania, after five hours of thunderstorms and hail. The wind was so strong I could not stop the Banana next to a pontoon jetty which would have risked being blown past by the wind before I could make a hand hold to tie the Banana. I drove straight into the steeply sloping quay where there were some steps. To hold the Banana in place I took the risk of leaving the outboard running fairly fast whilst and ran down the Banana, jumped onto and ran up the stone stairs, and tied the tow rope very securely to the steel fence and lamppost. I ran back down the stairs, jumped back onto the Banana, navigated all the petrol cans and equipment and turned the outboard off before it attempted to take off down the river. Exhausted, with repairs to make to the Banana and high winds I ended up staying four days at Cetate, a cultural center baces in an old port which was taken over by the Russian army and fortified with bunkers. The stay was not entirely comfortable. The welcome from some of the staff was good, others were rude and dismissive. Repairs done and better wind conditions I left to continue the long, slow, arduous journey on every widening river. I ran into hidden sand banks and gravel mounds just under the surface, invisible except for tell-tale unusual waves and swirls. Weed banks like fields had to be avoided, the motor clogging to a halt happened occasionally when I missed a below water The outboard performed steadily and entirely reliably and I was happy to come quite close to some of the ships. I made sure there was petrol in the tank before getting into range of other shipping having learned the hard way it was not a good idea for the engine to stop and try to refuel whilst drifting on the wind into the path of a cargo freighter. The Serbian border with Bulgaria caused a decision to have to be made. There were a few ferry crossings on the river and one bridge, at Ruse. I studied the maps again looking for suitable day journeys with suitable towns to meet up with the motorhome. The problem was that I had to choose which side of the river to meet up on as due to the lack of crossings one or the other countries had to be selected. Bulgaria had more small towns along the river than Romania along the next section so, crossing the bridge at Vidin into Bulgaria was the chosen route. The port of Vidin was on a bend in the river which turned the Banana once more into a strong head on wind. I had a lot of problems with this and used all the tactics I had learned in the storms to navigate against the wind. I stopped at the sides of ships to see if I could get a lift. They were either going to be loading for days on end or going up stream. I battled on against the wind, keeping near to the Bulgarian quays and port walls until the river slowly made its turn East, north-east and the wind came around to a 45° angle which caused a lot of work but was manageable. More small villages and tiny beaches with difficult rendezvous and always the threat of wind. Navigating the river became more involved as I was faced with complex systems of islands and sand banks, lack of bouys and wider expanses of water with larger distances to cross making the choice of direction important in terms of extra km to sail if I chose the wrong route. Ruse, a large port was navigated in a strong wind. I zig-zagged through the anchored shipping and hugged the quay side for protection from the wind. I passed under the bridge I had visited in October 2015, and saw it had finally been repaired. Almost holding my breath, I risked the Banana turning over and went under the middle section of the bridge, being bounced around on the swirling current. Two km later the motor stopped without warning. I checked the fuel tank and found no reason for the engine to stop. I started again but cut out each time I increased the speed. I drifted on the current and wind whilst tryng to start the engine and make it run fast enough to give steerage way. I continued on searhing for somewhere to stop and, eventually saw a beach with some houses nearby. 5 metres from the bank in the fast flowing current the engine stopped. Wind and inertia brought the Banana onto the gravel and I jumped ashore. After a long hot walk of 6km I found help, borrowed a wheelbarrow and took the outboard to a garage in a shed in the middle of the small village. Only four hours later I was back on the river. I had returned to the Banana to find the wind had increased and waves were lapping onto the shore. I was determined to make some more progress so scouted around and found a large rock, about 80kg, and dumped it on the front of the Banana. This ballast worked well and I found I could confidently head into the wind without fear of being turned over at any moment. I journeyed another 20km and arrived at Ryahovo, a small fishing village with a beach, a fish restaurant, security cameras and a very tiered sunburnt, lip blistered Banana captain. I intended to get some sleep and have a rest day. I swam in the river, visited a Bulgarian family and had lunch with them. The two days were relaxing but passed quickly and preparations to leave were made, possibly too soon as I did not feel fully recovered from the exertion’s and stress of the journey during the previous few days. I had learned several lessons about sailing a Banana which is not really a boat. However reliable an engine is it can break down. Wind and the elements, plus currents are the master; ignoring them is not an option. I was faced with the reality of the end of the voyage to Constantza, and the idea of going to Sunny Beach, a long way south on the Black Sea. I realised that without being towed, the Banana is not a seagoing vessel. I would have to be more than lucky to make the trip with just the outboard. 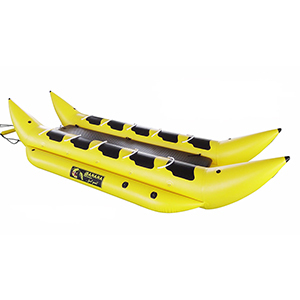 Any change of wind whilst at sea, or the motor stopping could have the Banana dashed on rocks or driven out to sea in whatever direction the wind and tides wanted to go. I had to rethink the voyage and face the reality that, if no towing vessel could be found I would have to settle for the accomplishment of sailing from the North Sea to the Black Sea, which if achieved would be no mean feat.